Kanaka ʻŌiwi Methodologies: Moʻolelo and Metaphor, co-edited by Katrina-Ann Kapaʻanaokala Nakoa Oliveira and Erin Kahunawaikaʻala Wright. For many new indigenous scholars, the start of academic research can be an experience rife with conflict in many dimensions. Though there are a multitude of approaches to research and inquiry, many of those methods ignore ancient wisdom and traditions as well as alternative worldviews and avenues for both discovery and learning. This fourth volume in the Hawaiʻinuiākea series, explores techniques for inquiry through some of the many perspectives of Kanaka ʻŌiwi (Native Hawaiian) scholars at work today. 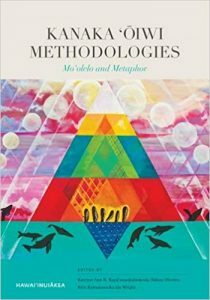 The book is a collection of “methods-focused” essays written by Kanaka scholars across academic disciplines; from Kawaihuelani, Dr. R. Keawe Lopes Jr., Dr. Kapā Oliveiera, and Maya Saffery. To better illustrate for practitioners how to use research for deeper understanding, positive social change, as well as language and cultural revitalization, the texts examine Native Hawaiian critical race theory, Hawaiian traditions and protocol in environmental research, using mele (song) for program evaluation, and more. E Mau Ai Ka Puana: After being in existence for a decade and being at the forefront of producing events that celebrate mele here at the University of Hawaiʻi at Mānoa, Ka Waihona A Ke Aloha: Ka Papahana Hoʻoheno Mele, under the direction of Dr. R. Keawe Lopes Jr., produced its inaugural Monograph entitled E Mau Ai Ka Puana. This inaugural publication features articles, research papers, essays and poetic contributions from faculty, graduate students, and undergraduate students of Kawaihuelani Center for Hawaiian Language. 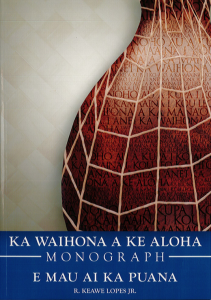 The hope for this monograph is to bring awareness to the importance of mele and encourage the celebration thereof while highlighting its significance across a variety of topics including: Niʻihau Hymnals, Theater, Story Telling, Kawaihuelani Graduate Student Research Topics and Mele Compositions by Hawaiian Language Majors. Ancestral Places explores the deep connections that ancestral Kanaka (Native Hawaiians) enjoyed with their environment. It honors the mo‘olelo (historical accounts) of the ancestral places of our kupuna (ancestors), and reveals how these mo‘olelo and our relationships with th ‘aina (land) inform a Kanaka sense of place. Katrina-Ann R. Kapa‘anaokalaokeola Nakoa Oliveira elucidates a Kanaka geography and provides contemporary scholars with insights regarding traditional culture—including the ways in which Kanaka utilize cartographic performances to map our ancestral places and retain our mo‘olelo, such as reciting creation accounts, utilizing nuances embedded in language, and dancing hula. A Kanaka by birth, a kumu ‘ōlelo Hawai‘i (language teacher) by profession, and a geographer by training, Oliveira’s interests intersect at the boundary where words and place-making meet her ancestral land. Thus, Ancestral Places imbues the theoretical with sensual practice. The book’s language moves fluidly between Hawaiian and English, terms are nimbly defined, and the work of the field is embodied: geographic layers are enacted within the text, new understandings created—not just among lexica, but amidst illustrations, charts, terms, and poetry. In Ancestral Places, Oliveira reasserts both the validity of ancestral knowledge systems and their impact in modernity. 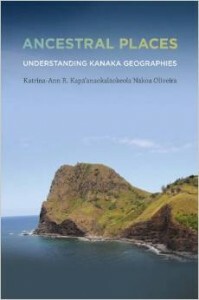 Her discussion of Kanaka geographies encompasses the entire archipelago, offering a new framework in Kanaka epistemology. Within ʻIke Ulana Lau Hala, Associate Professors R. Kekeha Solis & A. Kuuipolani Kanahele Wong share their unique perspectives on the art & craft of ulana lau hala. These are culture-specific voices, experts in their multi-disciplined fields of scholarship and practice–all essential to revealing the symbolic significance and relevance of an art form that is both utilitarian and beautiful. 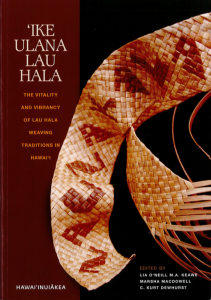 What is woven into these pages is a reminder of what some of us may have forgotten or not understood until we come to the place where a weaver’s skillful hands take up the plaiting of our moʻokūʻauhau/genealogy. In both a metaphorical and practical sense, ʻike ulana lau hala presents the vitality of those who have passed and the spaces that are still warmed by their breath. 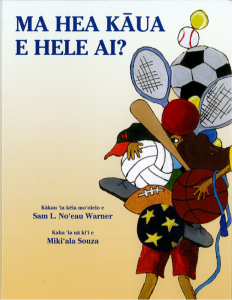 The I Mua Nō ka ʻUlu book series of 31 Hawaiian language childrenʻs books was made possible by a grant conceived and led by Dr. Noʻeau Warner. Primarily aimed towards K-3, the series was ultimately provided at no cost (and not for commercial sale) to all teachers, classes, students K-12, and families of Hawaiian Immersion Programs throughout the state. A unique aspect of the project is the easy to read approach to otherwise complex concepts and language structures in ʻOlelo Hawaiʻi. Mai Paʻa i ka Leo: Historical Voice in Hawaiian Primary Materials- Looking Forward and Listening Back The huge cache of native-language writings in Hawai’i has been eclipsed for a century, with only a fraction incorporated into modern knowledge. 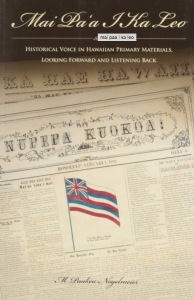 This book, by Puakea Nogelmeier, the Director of Awaiaulu, examines the hundred or more Hawaiian-language newspapers that were published from 1834-1948, highlighting how they developed as a national repository of knowledge and how they became obscured when English replaced Hawaiian as the the common language of the islands. 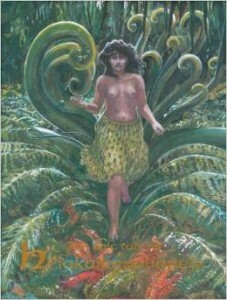 This ancient saga, translated to English for the first time, details the quest of Pele’s younger sister, Hi’iakaikapoliopele, to find the handsome Lohi’auipo and bring him back to their crater home. Graced with a magical skirt and wielding supernatural powers, Hi’iaka and her companions make their way through dangers and ordeals, facing spectral foes and worldly wiles. It is a very human account of love and lust, jealousy and justice, peopled with deities, demons, chiefs and commoners. This captivating five-hundred-page translation of Ho’ oulumahiehie’s original, articulated with 375 chants and lavish illustrations, showcases his profound cultural knowledge and engaging style for English audiences. It highlights Hi iaka’s role as a healer, source of inspiration, and icon of the hula traditions that embody the chants and dances of Pele and Hi’iaka. This is the most extensive form of the story every documented, offering a wealth of detail and insights about social and religious practices, poetry and hula, the healing arts, and many other Hawaiian customs. This magnificent work is also available in a volume presented exclusively in the Hawaiian language.